This November 10, 2012 marks two years since Maclean’s magazine published their racist article entitled “Too Asian”?. Across Canada, anti-racist activists, members of parliament, coalitions of over 100 organizations, writers, universities and youth decried the article, responded with public education panels, letters, petitions, flash mobs against Macleans and Rogers (the parent company). To date, Maclean’s and Rogers have declined to offer an apology for the article. 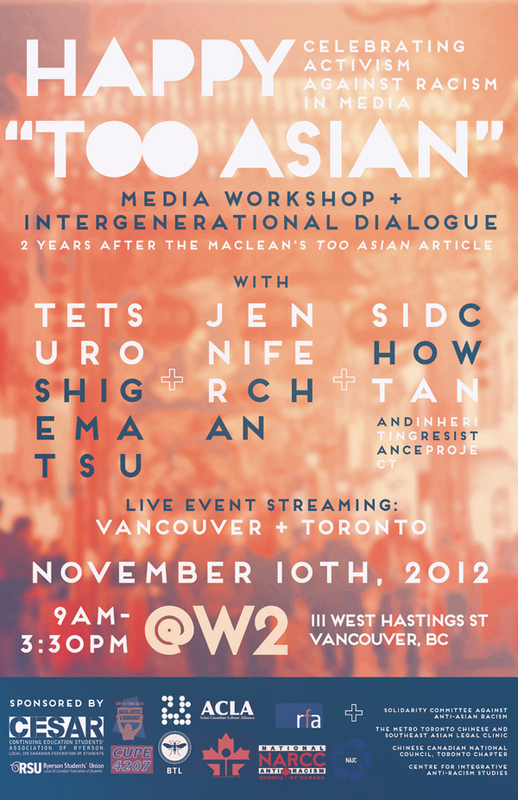 Now, it is two years later and HAPPY “TOO ASIAN”: CELEBRATING ACTIVISM AGAINST RACISM IN THE MEDIA is a one day cross-Canada conference celebrating activism and resistance to all forms of racism in the media. Coffee and morning refreshments will be provided. Pay cash at the door or credit card online at time of purchase. Tetsuro Shigematsu– Called the “the voice of our azn generation” by the Managing editor of Ricepaper magazine, Tetsuro Shigematsu is one of the most provocative new columnists for The Huffington Post. A former writer for This Hour has 22 Minutes, Tetsuro was the first person of color to host a daily national radio program in Canada for the CBC. Follow him @tweetsuro. Jennifer Chan– is an Associate Professor in the Faculty of Education at the University of British Columbia. In May 2010, she brought a racial discrimination complaint against UBC to the BC Human Rights Tribunal. The BC Supreme Court hearing on this matter will be held on November 13, 2012. Sid Chow Tan and the Inheriting Resistance project – Raised on Main Street in Battleford Saskatchewan, a graduate of the University of Calgary and an over thirty-five year resident of Saltwater City Vancouver, Sid is best known for his over two decades of work in community media and redress for the Chinese head tax and exclusion laws. His media and politics is informed by a life of anti-racism and social justice activism, occasionally resulting in civil disobedience and arrest. Chris Ramsaroop – community organizer with Justicia for Migrant Workers.